C-Flex® ULTRA shown being pumped through a standard pump head. C-Flex® — from Saint-Gobain Performance Plastics — a unique, patented thermoplastic elastomer specifically designed to meet the critical demands of the biopharmaceutical world, is now BETTER THAN EVER. C-Flex® ULTRA exceeds the industry's demands for a flexible, clear, sealable, and weldable pump tube for fluid processing applications. This new 60A C-Flex® material has been developed to outperform existing C-Flex® and every other 'look-alike' on the market. It has been extensively tested by independent organizations and is consistently outperforming every known competitor. tubing failed at less than 12 hours. Feature Rich Formulation. C-Flex® ULTRA complies with USP Class VI standards and is manufactured by Saint-Gobain under strict GMP guidelines. It is non-pyrogenic, non-cytotoxic and has excellent resistance to concentrated acids and alkalis. The ULTRA formula is significantly less permeable than silicone and has low platelet adhesion and low protein binding characteristics. Sealable and weldable. C-Flex® ULTRA can be thermally sealed and rewelded making it ideal for the biopharmaceutical filling and sampling processes. Significantly extends the life of pump heads. The lack of surface tackiness typically found with TPE tubing reduces the need to clean gummy pump heads - greatly extending their life. • Very low spallation during the pumping process - lower spallation than any other TPE or silicone formulations. • The smoother outer surface achieved by the new ULTRA formula does not gum pump heads like other TPE's. • Excellent clarity – fluid is easily visible through the translucent tubing wall. • Sealable and weldable either pre or post-gamma irradiation. • Available NOW in 10 standard sizes (ID x OD). Custom sizes, lengths and packaging also available upon request. • Produced from the same C-Flex® materials that have been validated by biopharmaceutical companies for over two decades. 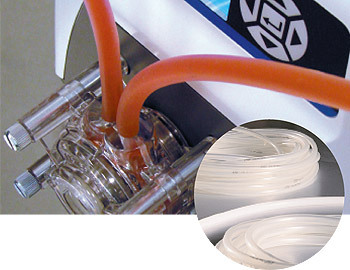 • C-Flex® ULTRA has been designed to continue the tradition of providing the biopharmaceutical industry with over 25 years of success with the original C-Flex® family of TPE tubing. * tests performed by independent lab at 600 rpm/15lbs back pressure.